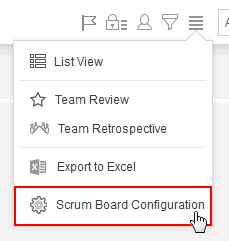 The Scrum Board can be configured from the Scrum Board. 1. Access Scrum Board from menu. 2. Click on Action Menu on header. 3. Select Task Board Configuration. 4. Click on Add a Lane to add a lane. 6. Click on Save button to save the added lane. Click on Add a Lane to add an additional lanes to the default work flow i.e. "To Do", "In Progress" and "Completed". For the lane under a field Title. To add it in a work flow. To change the order of the lane. By clicking cross icon provided on each lane top right corner.